OS grid reference NY3724 0344. About ½ a mile to the south of Ambleside, south Cumbria, along Borrans Road which is the A5059 and close to the mouth of the river Brathay*, near the northern shoreline of Lake Windermere is Borrans Field Roman Fort or, the Roman name of Galava and, or perhaps Glanibanta, according to the Ordnance Surveys ‘Historical map and guide to Roman Britain’ 5th Edition, 2001. Although the former name is the one that is now generally accepted. Or could it be that the Roman fort at Ravenglass some 18 miles away to the west on the Cumbrian coast is the one called Glanibanta (Glannobanta), rather than the usual Roman name given to it: Itunocelum? Confusing, yes it is, but these Roman names for forts and towns are always “open” to question, are they not! This small fort stands in the area known as Waterside, Eskdale. The earthworks and foundations of the fort can clearly be seen in what is locally called “Borrans Field’ where signboards mark out the fort’s features. There were two forts on the site – the first “Flavian” fort being built in the late 1st century AD at the time of the northern campaign of the Roman general Gnaeus Julius Agricola (79-85 AD) – the second one was built over this and probably staffed by an auxiliary cohort of soldiers in the early part of the 2nd century – that is if a piece of stone with an inscription to that effect found during excavations is to be believed. 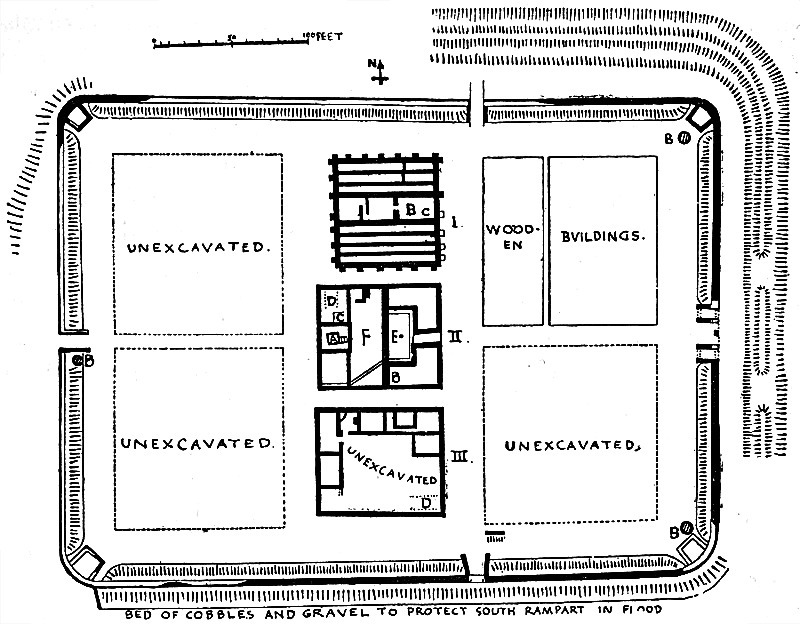 The oblong-shaped enclosure of the fort covers about two-and-a-half acres roughly 300 feet by 420 feet though Prof R.G.Collingwood of Pembroke College, Oxford, who first excavated the site and wrote about it, gave the measurements as 270 feet by 395 feet. It was surrounded by a stone wall 4 foot thick with a clay and turf rampart 10-12 feet across at the back of that and, a ditch to the front. Towers would have been positioned at each of the four corners with four gated entrances – three of these being fairly narrow though the fourth gate (the porta praetoria) at the east-side was double-gated and had guard rooms at either side. All the main buildings were situated in the middle of the fort with four other large barrack block buildings, probably of timber, around the sides of these and, as yet, not excavated. As usual there were the granaries (two buildings) measuring 60 feet in length, three headquarters blocks known as ‘the principias’ or Praetoriums roughly all 70 feet by 80 feet; also a sacellum (cellar) for altars around 6 foot square, the commandant’s house 70 feet by 80 feet and two other unexcavated buildings. Also, inner and outer courtyards as well as a ditch which could be from the late 1st century fort. According to Prof Collingwood, the fort was abandoned sometime after 85 AD but rebuilt and enlarged during the time of the Emperor Hadrian in the early 2nd century AD. Collingwood believed it was destroyed twice during the 2nd-3rd centuries. The fort of Galava was finally abandoned soon after 365 AD. Today the site is in the care of English Heritage. Galava Roman fort stands on the course of a Roman road which runs west from here linking up with the forts at Hardknott (Mediobogdum) and Ravenglass (Itunocelum) also known as Glannobanta or Clanoventa? At Ravenglass there is a well-preserved Roman bath-house attached to the fort called ‘White Walls’ standing to it’s original height and, is probably the best preserved Roman building in the north of England. The Roman forts at Watercrook (Alavana) and Brougham (Brocavum) to the east and south-east are “somewhat” in doubt with regard to being linked strategically with the fort of Galava, although this is still open to question. There have been a number of archaeological finds and these can be seen in the Kendal Museum. A tombstone found in the 1960s at the eastern-side of the fort is inscribed with the epitaphs of two Roman soldiers: Flavius Romanus and Flavius Fuscinus, who may have been related; also a piece of stone inscribed with the word COHORT, and some coins from the late 1st century to the 2nd century. Pottery, glass, iron and bronze objects, as well as a lead basin were also found. Collingwood, R.G. Prof., Roman Eskdale, Methuen, London, 1914. Collingwood, R.G. Prof., The Archaeology Of Roman Britain, Methuen, London, 1930. Fraser, Maxwell., Companion Into Lakeland, Methuen, London, 1939. Ordnance Survery, ‘Historical map and guide Roman Britain’, 5th Edition, Southampton, 2001. *Thanks to Mike Nield for his info on the location of the fort at Borrans Field. 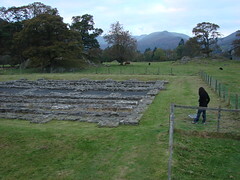 Categories: Borrans Field Roman Fort At Ambleside In Cumbria, Roman Sites | Tags: Borrans Field Roman Fort near Ambleside in Cumbria | Permalink.